Life is all about connections. Some are planned; some are ad-hoc or seemingly random in nature. Having met Regina Spotti, the American author of this month's CotM article, several times (and never in the same country), I was surprised and delighted to learn of her interest in auchenipterids. In that instant I knew she was the right person to have some fish in my possession: this article begins with that happy connection. Nearly a year later, in adding this month's CotM article to the site, (a great piece on the first captive spawning of a beautiful woodcat), I noted that the author sits right next to Dutchman Marc Stabel in the long and alphabetically sorted list of all PlanetCatfish contributors. Marc has brought woodcats to a wide audience in his forum mega-thread and Regina is also on her own woodcat mission. It seems Lady luck is not without her sense of humour. This is an advert for the real need for conventions, for fishkeeping gatherings and for boundary-free discussion of the fish we love. Over to Regina now to explain more. While others are participating in the L-number craze, I continue to search for auchenipterids. I am having limited success in the U.S., but as fate would have it, I really lucked out when I attended the UK's Catfish Study Group Convention in 2012. I was delighted to be asked to attend the convention as a speaker along with my fiancé Eric Bodrock. I was doubly delighted when Jools offered me three pairs of juvenile Tatia strigata at the end of the convention weekend. My heart was beating so hard with excitement I barely heard the asking price; and I felt quite the fool asking him to repeat it! [Note from Jools: That would be my accent]. When offered the fish, I jumped at the chance to have them. I would in all likelihood never find this species in the U.S. and I was totally excited about the opportunity to work with them. That is, until Eric reminded me that within one week of returning home, we would be turning our lives (and our fish room) upside down. We were going due to sign papers for a new house almost as soon as we got home. Preparing two homes at the same time, one to vacate and sell and the other one to move into and rehome about 120 fish tanks of all sizes was a daunting and frightening thought at that very moment! My biggest fear was that I would be so busy with "woman's work" and my regular full-time job that fish would be last on my daily list of things to do. But that worry would have to take a back seat. After all, we weren't moving for a few months yet. And this is a beautiful species of wood cat — fat chance I could forget about them! Well, the fish made the trip across the pond (as those that live on either side of the Atlantic ocean like to call it) with no problems. They were acclimatised into a five and a half gallon tank that I had left unoccupied for any new fish arrivals. The tank was equipped with a sponge filter, a half- inch layer of black sand and some Java moss and Java fern, along with a few floating plants to block out some of the fluorescent light. No other fish were in the tank. The Tatia quickly hid under the sponge filter and the Java moss. After letting them settle in for a few days, I fed them some chopped black worms. As was might be expected, this caused quite the stir in the tank:-there was so much frantic swimming activity that I feared they would raise lift the glass lid! These fish are not finicky eaters and have accepted any foods offered to them from chopped earthworms, white and grindle worms to live daphnia and glass worms (that they gracefully pluck from the water column) to gel and pellet foods. As is typical of the wood cats, they spend most of their time hiding. It was March when they made it home to our fish room in our old house. That was March: they stayed until Eric began to move tanks into a temporary set up in our new house. After that Herculean task was completed (all by himself, God bless him! ), the fish found themselves in that same tank, but in a cooler room and close to a bare concrete floor. The temperature in the new room was 78°F/26°C. We do not keep heaters in our tanks unless a species of fish require it, so the tank temp was between 68-70°F/20-22°C. I didn't forget about them; they hid and ate and grew quite well. Did I mention yet that they are beautiful? During the month of August, we were both quite busy with our new "yard". I spent most of my free time hand-pulling poison ivy to create flower beds and a lawn area while Eric was busy hand-digging a drainage ditch. That left little time for water changes and feeding time was generally a rushed (and sleepy) pinch of some worms of one sort or another into my tanks. Each evening they did receive live baby brine shrimp. Despite no water changes in August, and the fish did not seem to mind, they fattened up and grew into beautiful, dark chocolate-brown fishes with clean silvery stripes running laterally. When I did sit and watch them, I was amazed at how beautiful and lithe these animals are. In September of 2012, the ninth to be exact, the Tatia laid a mass of eggs in a tangle of Java moss. I must apologise now as I took no photographs of the eggs. With autumn approaching, my desire to have a poison ivy free zone on our property superseded everything else. And as is usual when one is busy, things are put off until the next day - which of course is put off yet again. The egg mass was removed from the parents' tanks and placed into a plastic shoebox with an airstone and some Java moss. I used water from the parents' tank and turned the air flow to just break the surface area and not toss the eggs around. The pH of the water was 4 and the temp was 74F/24°C. The eggs resembled the clumps of Tatia intermedia, a mass of perfect clear orbs with pale creamy yellow coloured yolks in the middle. You can actually see the tails at one end and the minute heads of the fry at the other. Unlike T. intermedia, these eggs are were smaller and the fry are not wriggling their tails (T. intermedia slowly move their tails back and forth while they are in the egg sac until they hatch, resembling the pendulum on a clock). They seemed to be suspended in their casing and one day, they just popped out into their watery world. The fry were slivers of mottled grey with a black head area and a large egg sac. They moved little, unless they were disturbed or fed. After the third day, the egg sac was absorbed and I gave them green water, powdered fry food, and a sponge filter was squeezed into the fry box to give them something to pick at. They moved up into the Java moss; and I'm unsure whether this was for safety or if they are able to find minute food amongst the strands. They fry have tiny, tiny mouths and I was fearful they would starve. It was almost one full month until they were able to eat baby brine shrimp. Their growth rate is painfully slow regardless of how much food they are given, or how often the water changes occurred. The fry are cannibalistic: as I watched some grow larger than the rest. I began with quite a few fry from three spawns and the smaller fry always seemed to disappear while I watched others grow noticeably larger than the rest. It was difficult to count the fry — they zip around like mad when they are disturbed. Out of necessity, the parents were relocated to a rack higher up in the fish room. And now that winter is here and the outside temps have dipped to the low teens, the fish room is warmer, therefore the higher tank temps are higher. No spawning activity has been seen since the this move to a warm spot on the rack, but I intend to find them a cooler room in our basement and to see if this might induce spawning again. The next time they spawn, I'll be sure and take photos and share them. This is a lovely species of driftwood cat and I would encourage anyone who has an interest in them to keep this species. Type Locality Municipio de Maués, Igarapé Limãozinho, Amazonas, Brazil. General Remarks Imported and photographed for the first time in early 2011. 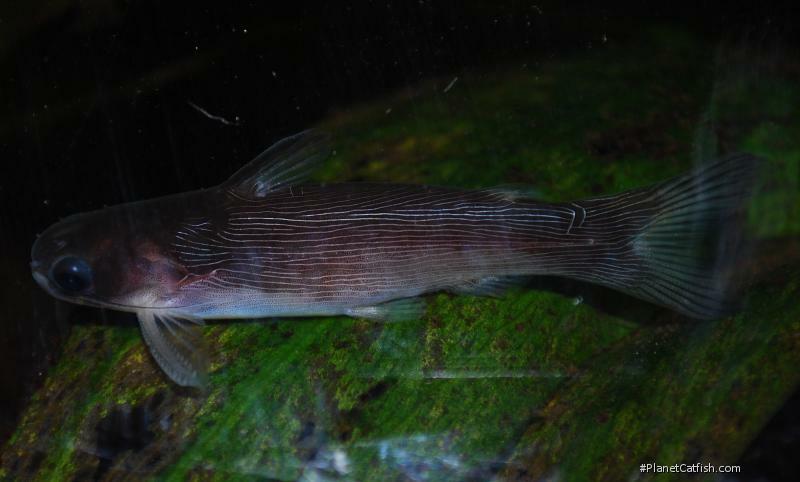 Although the description of this species notes the maximum length of specimens treated therein as 32mm, aquarists have recorded the species up to at least the SL presented here. Distribution South America: Amazon River basin and upper reaches of the Orinoco, in Brazil and Venezuela. Feeding Feeds mainly on insects.